Jimmy Kimmel is a father once again. On April 21, Kimmel and his wife, Jimmy Kimmel Live! co-head writer Molly McNearney, welcomed their second child together, William "Billy" Kimmel. But at just 3 days old, the littlest Kimmel had to undergo open-heart surgery at Children's Hospital Los Angeles. Fortunately, all went well, and Billy is now home with his parents and older sister, Jane. Kimmel opens up about the complications on tonight's show and encourages those watching to donate to the Children's Hospital. Later in the show, he'll be joined by guests Dr. Oz and Shaun White, who suffered from the same heart troubles as a child. In fact, the Olympian had to have three open-heart surgeries when he was born — a subject he'll surely discuss on the show. Kimmel referenced President Donald Trump's proposed $6 billion cut in funding to the National Institute of Health and said he was glad "our congressmen made a deal last night not to go along with that." He said his son was born with congenital heart disease and also expressed that partisans from both sides should come together in providing everyone with access to health insurance. 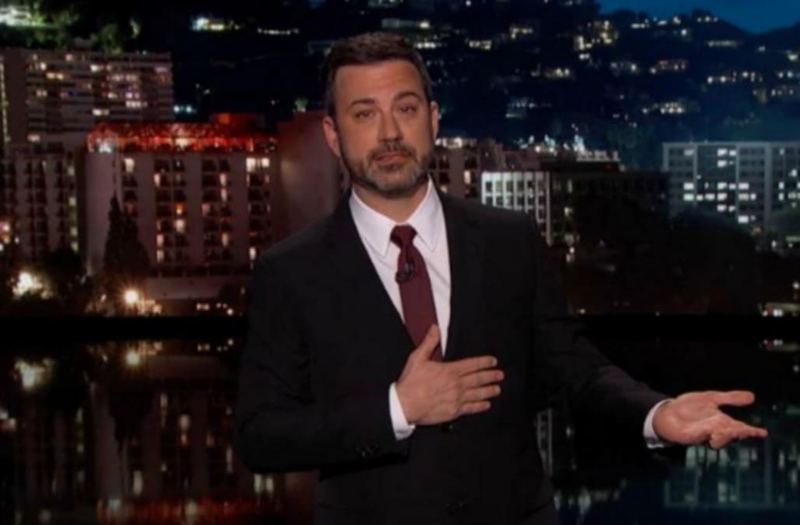 "If your baby is going to die, and it doesn't have to, it should not matter how much money you make," said Kimmel, who teared up during his monologue. Given the circumstances, Kimmel has decided to forgo his annual appearance at ABC's May 16 upfront presentation to Madison Avenue ad buyers. Instead, he will remain at home with his family. Without any sort of announcement or fanfare, Kimmel quietly went to repeats last week when his son was still in the hospital. Assuming there isn't a writers strike, he will go out on paternity leave for the remainder of this week. If there is a work stoppage, the ABC late-night show, like those on the other networks, is expected to go dark. In his stead, Kimmel's friends have lined up to guest-host Jimmy Kimmel Live! Will Arnett is set for Tuesday's show, with a special appearance from his Gong Show host, Tommy Maitland.Anthony Anderson is on board for Wednesday, while Kristen Bell and David Spade will take over on Thursday and Friday, respectively. The guest list for the week includes Maya Rudolph, Charlie Hunnam, Adam Scott and Guy Ritchie. Video from tonight's show is above.